“These paintings are inspired by the desire to honor my family history and experiences that are fading, gone, or were well before my time. They reference photos from the 1950’s (post WWll Latvia)-1980 (when my family immigrated to the United States)”. To make paintings in honor of the family is to celebrate and remember its existence but Lerman uses photos which, typically, already serve as memories. Family photos are the evidence, the signs, that the family was, and provide a sense of continuity and context, even likeness for heirs to compare themselves, to find lineage. 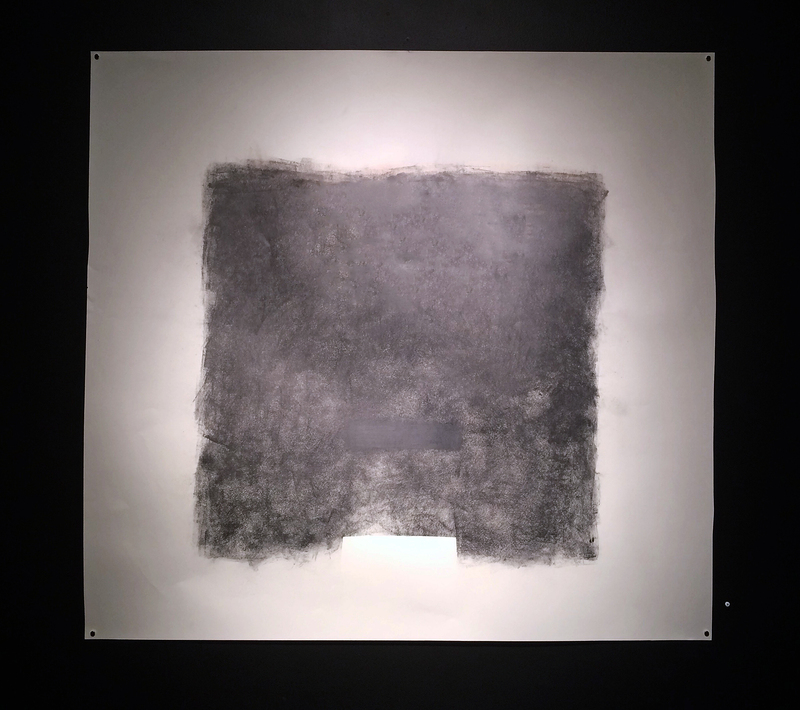 As artifacts, they carry with them their own cultural information: the serrated edges of the square format photos, the fading chemicals used to make them, and the eroding paper on which the images are printed, these things locate them in time. What Lerman is after is more complex than either the fact and corroboration of their existence. The first image that we encounter, and there is a definitive evolution of the twelve paintings, is “Baba, Dzeda and Mom before Joseph arrived (Riga 1955).” It is a black and white painting with pink tinges shadowing the figures. (I learned that Lerman painted over a painting of her grandfather with which she was completely dissatisfied: “There was red in it.”) We get a sense of her pursuit by the title. Baba and Dzeda are Russian names commonly used for Grandmother and Grandfather, and it is clear in this painting that Lerman was after likeness to the photo and mirroring the initial effect of the image at which she is gazing. She is interrogating the photo searching for connection. Whether intended or factual or not each figure has the same brush- stroked nose to accomplish the notion of family. Wonderfully the act painting contains a genetic component. Most interestingly Dzeda’s half of the portrait is shaded darker than Baba’s and her mother (Lerman’s mother), the baby between them, is half shaded and half in the light, representing a genetic sharing of her parents. Is this a conscious mirroring of the photograph or is it a factor of Lerman’s desire to find likeness in her family? 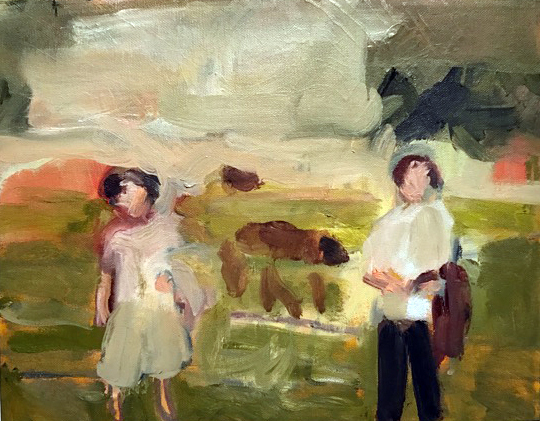 While classically sober, in keeping with traditional family portraits, it is an energetically expressionistic rendering of her mother and grandparents. Each brush stroke is deft and fraught with meaning. 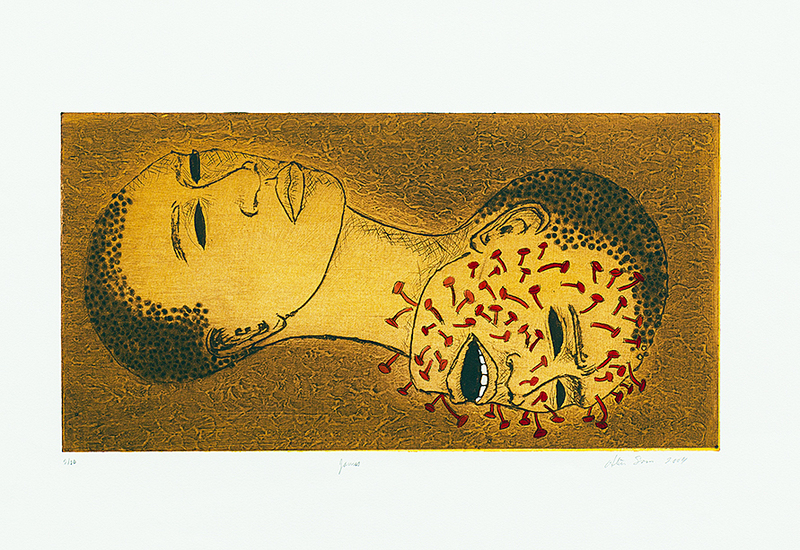 The figures express an innocently touching but uncertain humanity. Photographs might be considered a pure, distilled concentrate, a moment composed of many recognizable signifying features, a face, a nose, a certain dress, of a life. 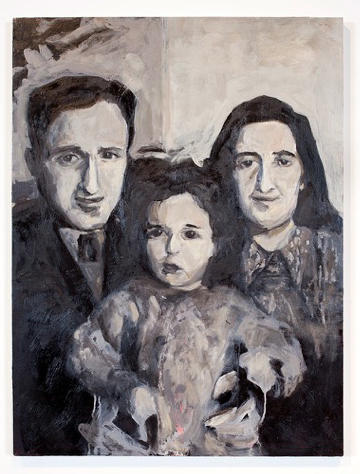 In her paintings Lerman is working at reconstituting a family “fading, gone, or were well before my time.” The painting becomes the echo within her of first family, of ontologically, her beginning. The painting is a reification of that history. It is not a slavish copying, but a deep mining of herself to affirm their lives. There are two other paintings from Riga. One is “The Baby with Fever (Riga 1976)” based upon a photo of Lerman as an infant, straddled and supported by her parents. Her mother told her that because she was sick with fever she had bundled-her- up against the cold. Lerman painted-out, or intentionally left her parents out, and added color to the black and white image as if to create a reality for herself as a child that has faded or that she never had. It is a loose, gestural painting, with the sense of the infant almost rescued out of the painted-out background. 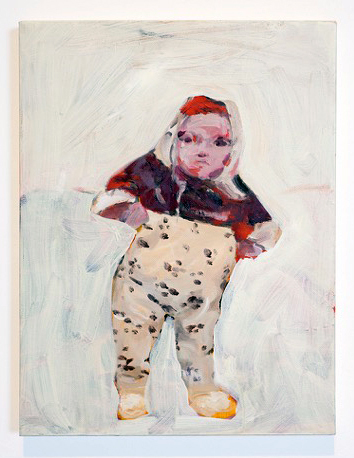 There is also a look of decisive and emerging identity in the painting of the infant that Lerman has asserted. 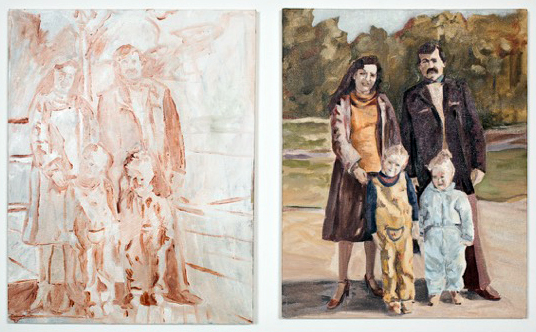 The other painting, “Rainis Park (Last family photo taken before coming to America,1980),” is a diptych. One panel is an almost transparent, study-like sketch of Lerman’s immediate family, her mother, father, sister and her. Riga’s Rainis Park is infamous in history as a site where in June 1941 the Nazis gathered and shot 300 Latvian Jews, and thousands of other Russian patriots and Jews were murdered in and around Riga. The transparent quality of the study, juxtaposed to the second painting that reveals a stylish and life-affirming family, throws a painful question into Lerman’s narrative tableau of what could have been. Faina Markovna Lerman is a multi-talented artist and cultural activist and “Family Album” isn’t simply an exhibition of her artistic talent as a painter but illustrates her broad view of personal identity and our collective history. 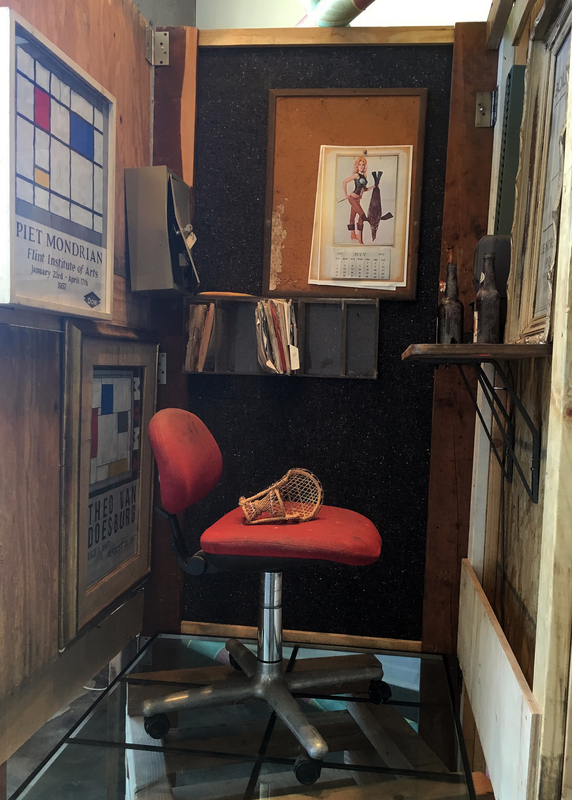 The exhibition is punctuated by a few simple family possessions– original stools, linens, baby blanket and Russian Nesting dolls (Matryoshka)– that were brought from Russia when her family migrated to Detroit in 1980. The Latvian symbol for growth, fertility and prosperity, which is on the cover of her family album is reproduced on the wall of the Cave Gallery. Russell Industrial Center 1600 Clay St. 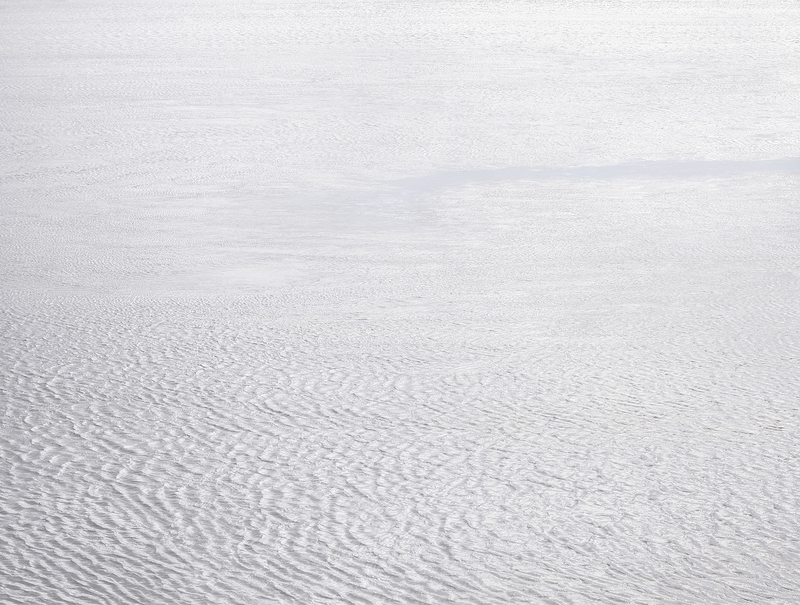 There is a striking contrast between the work of Carla Anderson, photographer, and Elizabeth Youngblood, abstract artist using various mediums, now on exhibition as Chosen Silences, opened in midtown Detroit, at Galerie Camille, April 7 – 27, 2017. These two artists share an attraction to abstraction and contemplation but deliver their ideas using different media. This certainly must have contributed to the idea of an exhibition together as the work is not presented in different spaces, but is intentionally integrated, with the purpose of bringing the viewer along as they peruse the gallery space. It’s a good idea. 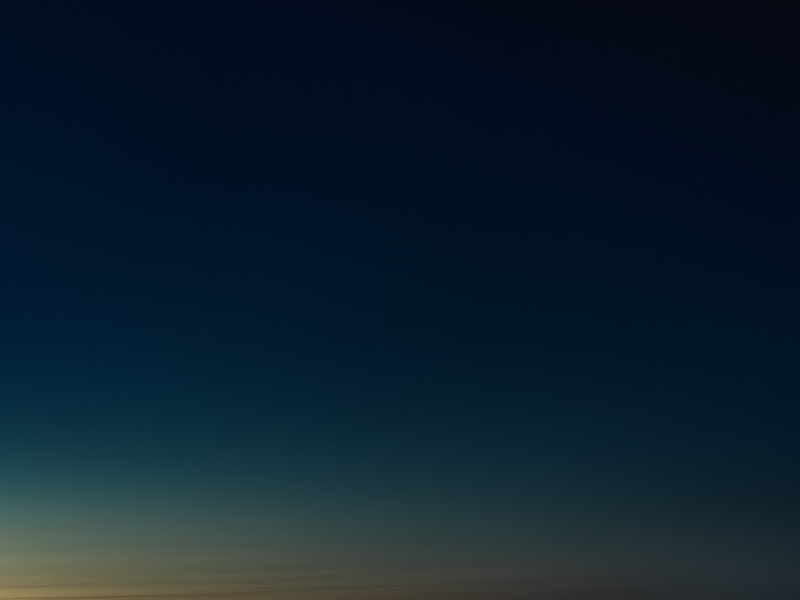 Anderson’s photography reminds me, at times, of how I feel when I am looking at a color field painting. These large, 30 x 40” images (sometimes digital, sometimes film) are about the space in nature, captured beautifully using large format cameras, and presented in a way that does not go unnoticed. And I must mention scale, because these photographs would not have the same impact if they were printed in, say, 8 x 10”. 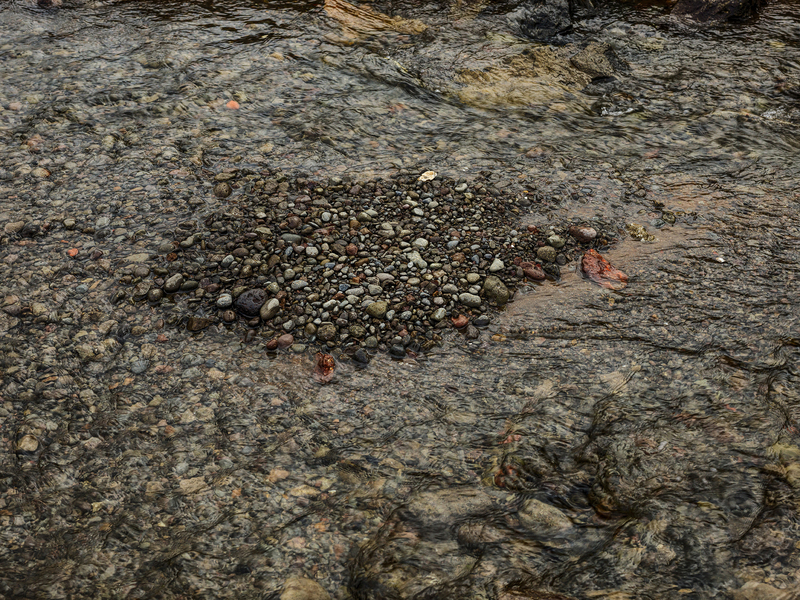 The large-scale print brings the viewer intimately closer to the subject, as in West Fjords 5, photographed in Iceland, in a way that draws you into a universe of these small stones or in the reveal of an oncoming night sky in Emmett County. There is a large context for Andersen’s work, who was awarded her BFA from CCS, 1976 and her MFA from Cranbrook in 1978. Her influences could have been a combination of Carl Toth and George Ortman, both teachers at the studio-based Cranbrook Academy of Art during the 1970s. 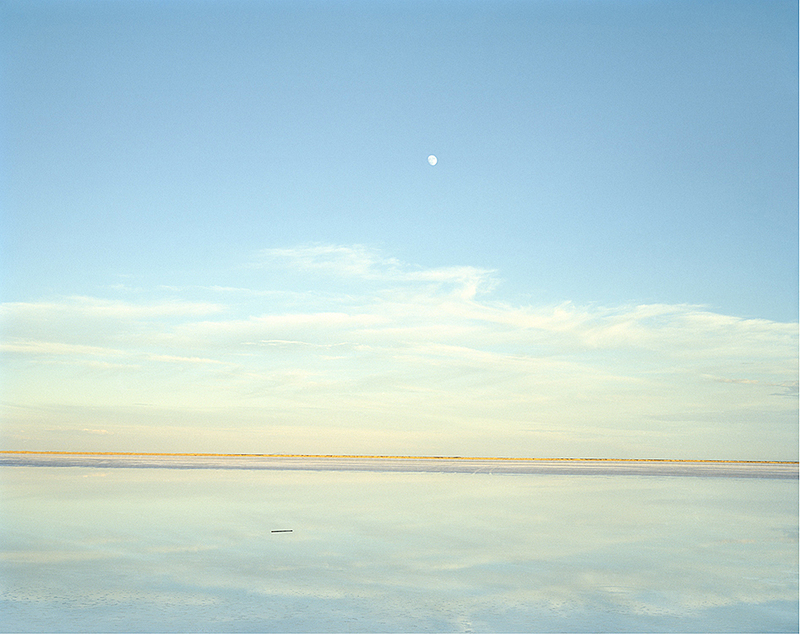 Probably more important would be her exposure to the work of Edward Weston who did abstracts of the desert, as in Oceano 1936, Eliot Porter, as in Pool in the Brook, 1953, or more recently, Joel Meyerowitz as in his large color image, Dawn Hardline, 1980. This work, sometimes called non-objective, relies less on representational objects and more on color, light, texture and form that conveys a feeling or an impression. I have always been drawn to the work of Man Ray’s series called Symmetrical Patterns from Natural Forms first exhibited in Germany in 1914, where he experimented with objects, light and form. The American, a Russian immigrant from Philadelphia would become close friends of Marcel Duchamp and engage in avant-garde photography throughout the 20th century. That’s not to say Andersen’s work is avant-garde at this point in time, because of the groundwork laid down for nearly a hundred years of photography. 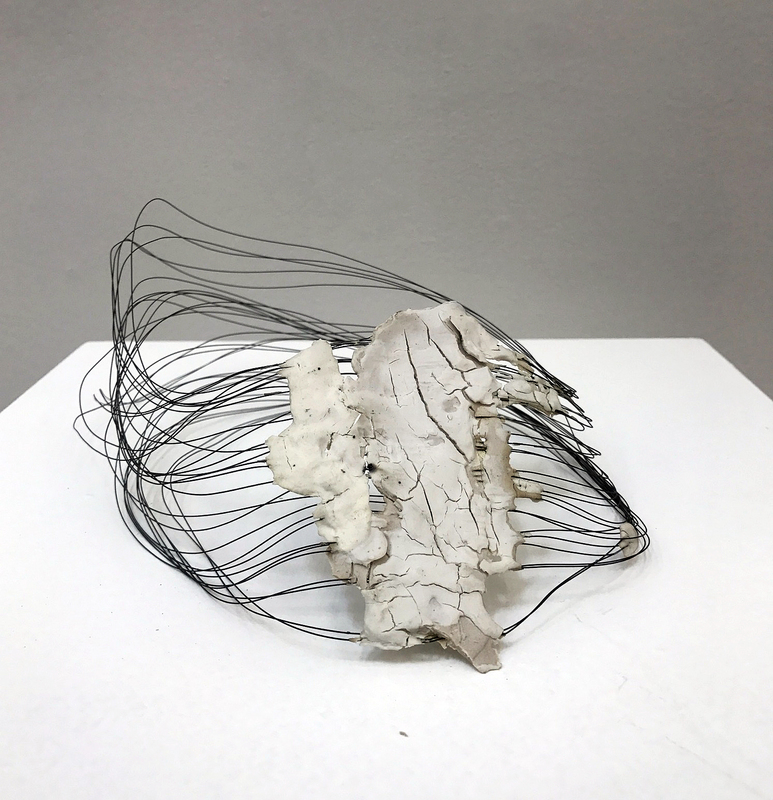 Elizabeth Youngblood’s work is multi dimensional, a mixture of three-dimensional objects made from ceramic and wire, and a collection of black and white drawings on paper. The contrast between the porcelain bars and the strands of thin black wire, as in #6 Flat Horizontal, provide an interesting play between material and as a relief, the shadows from the light adds to the dimension. Youngblood was awarded a BFA from the University of Michigan and an MFA from Cranbrook Academy of Art, where she studied design with the McCoys, who I have turned to several times for design work. No doubt they had an influence on her work, probably more about the process of developing conceptual ideas. It’s possible this eventually led her away from working as a graphic designer, more towards to becoming a fine artist. It’s always a challenge to decide how large to make a three dimensional piece of work. If I were to dare to offer a constructive idea for her work, it would be to pay more attention to scale, pretty much across the board. 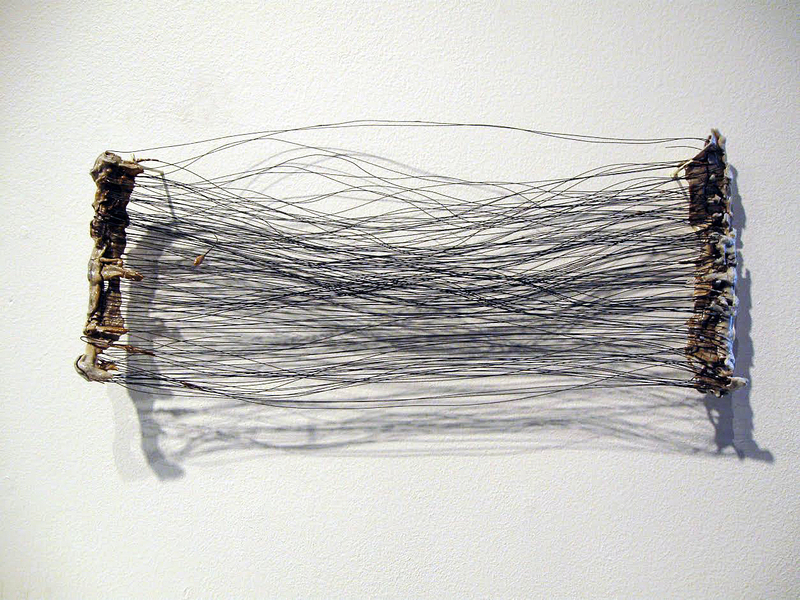 In contrast to the more didactic and delicate wire pieces, and in a minimalist fashion, Youngblood makes the drawing, Large No. 3, where she applies more graphite than is necessary to make a point about the material and the pressure applied. In this drawing, she illustrates ‘no fear’ in executing a powerfully bold and massive block composition, challenging her viewer to ponder her intent. Who introduced abstract painting to Western culture? Today, Kandinsky is given credit as the father of abstract painting as early as 1910, with first a watercolor, then on canvas, but he had a manifesto in which he wrote about abstraction in 1909. Personally, I think abstraction will be in our art vocabulary for years to come, synonymous with words like cubism, impressionism and realism. David Klein Gallery has an exhibition of eight artists from various parts of the country that opened March 18, 2017, representing both paintings and sculptures. On the Road: American Abstraction, surveys artists from other parts of the country, providing the Detroit audience with abstract sensibilities on both the east and west coast, as well as work from the Midwest. 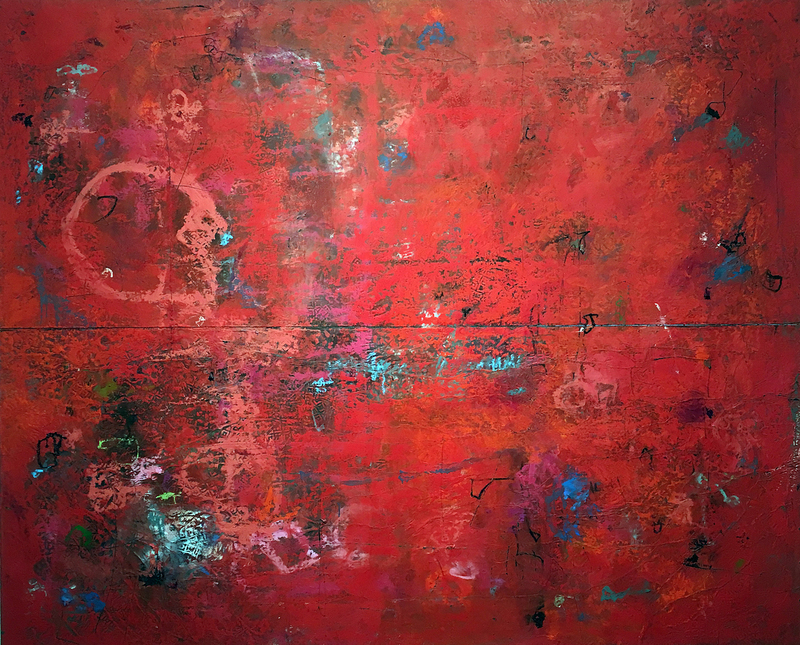 The work that grabbed most of my attention was the large red field abstraction by native Californian Hugo McCloud, who now lives and works in Brooklyn, New York. The horizontal diptych fuses unconventional materials, along with woodblock printing, where he creates a rich surface that reflects a type of urban decay. The rich surface contains a large variety of under painting both in terms of shape and color. Self-taught with a background in industrial design, he says in a statement to artnet, “All of my work is kind of process oriented. When I had a desire to go into the fine art realm,” he explained, “I didn’t really have an understanding of how to work on canvas or use brushes and traditional art making tools. That wasn’t really my foundation.” McCloud stretches his canvas out on the floor, sanding, marking, all driven intuitively by his desire to explore and uncover his personal aesthetic. On the other end of the abstract spectrum is the work of Gisela Colon, raised in Puerto Rico where she completed her undergraduate work at the University of Puerto Rico, and her JD from Southwestern University of Law, in Los Angles where she now resides. 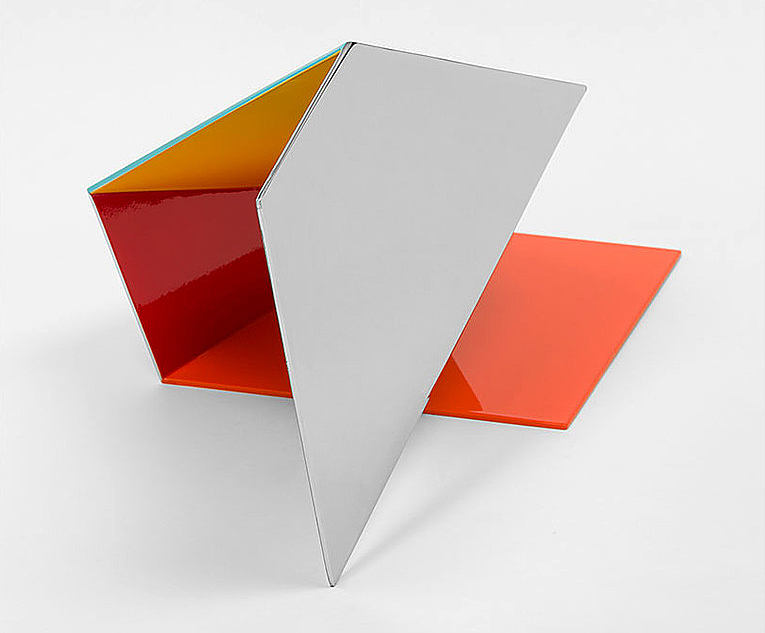 Her earlier work was acrylic over wood constructions, painted with an automotive lacquer, but here in this piece at the David Klein Gallery Irregular Rectangle Glo-Pod she has turned to the technique of blow-molding that uses sheets of colored acrylic. She calls that and subsequent pieces made without the use of paint ‘Glo-Pods’ due to what she deemed “a breakthrough in my use of materials that generated an internal self-generated glo without the use of paint.”Her work has been connected to the work of west coast artists interested in the properties of light and the nature of perception. To this writer, these sculptural objects have a focus that draws on the writings by Donald Judd and Robert Irwin from the 1960s. These ideas may have set up this minimalist approach to creating objects as sculptural reliefs using properties of light, technological elements and reductive forms that, in this case, attach themselves to the wall. 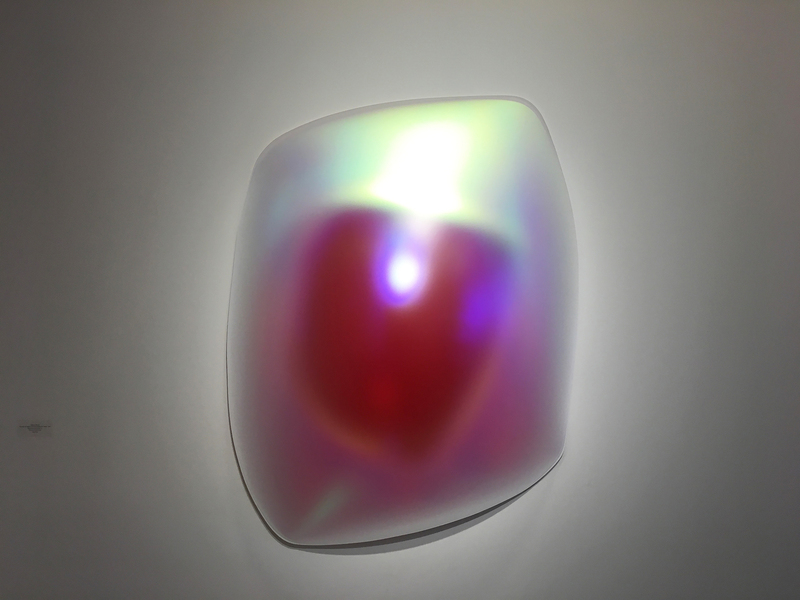 The non-specific objects hover between painting a sculpture where light is emitted from within, creating a very contemporary piece of artwork designed to please. These abstract planes take me back to Tony Smith, allied with the minimalist school, where he worked with simple geometrical forms combined on a three-dimensional grid, creating drama through simplicity and scale. Created by artist Brad Howe, from Stanford University, these relatively small folds of stainless steel are impeccably constructed with effort and thought, providing simple form and color with attention drawn to their edges. Given the amount of concern that sculptors give to scale, these pieces feel like models waiting to be fabricated forty times larger than these tabletop sizes. A native of Los Angles, Alison Saar’s work is primarily figurative, often female, in various emotional states or physical expressiveness. She seems to find symbolic richness in found objects, often with a narrative that offers a metaphoric view of life’s possibilities. The David Klein Gallery has a long history of representing a collection of Detroit artists living and working in the Detroit Metro area. In contrast, On the Road: American Abstraction, Christine Schefman, Director of Contemporary Art, draws on artists who are represented by galleries from New York to Los Angeles, providing thought on some new experience and provoking exposure to the Detroit art community. The actions and words of our latest president, the bizarre but predictable choices for his cabinet and advisors, yesterday’s horrifying news of 200 civilians dying in the new president’s escalated bombing of Mosel, Iraq, so reminiscent of the televised Vietnam War — all of this makes us think of the moment of Richard Nixon and of events leading to and following that debacle. Simone DeSousa Gallery presents a collaborative exhibit that beat MSNBC and the other news networks to the punch in this realization. The show, “Delights of the Garden,” is a collaborative meditation/installation on the Vietnam War by Ben Hall, Andrew Mehall, and Jason Murphy, three Detroit artists who are too young to have been there, but who are very conscious of Trump and company’s echo of historical circumstances. Ben Hall, Andrew Mehall, Jason Murphy. Collaboration 2017 Image Courtesy of Simone DeSousa Gallery. Entitled after the 1977 album “Delights of the Garden,” by the Black Nationalist, proto-hip-hop group “The Last Poets,” the installation is composed of objects, graphics, and videos, an array of materials implying comparisons between the nightmarish circus of the Vietnam era and our contemporary landscape of White House clowns. The album itself listened to by the artists in their youth, is a taut, poetic narrative of the everyday life of the Vietnam era in the face of horrors of nuclear annihilation. It doesn’t narrativize the installation; in fact, as a credit to the artists, it is not even used as a soundtrack for the exhibition but provides a psychological landscape and an amazing evocation of black consciousness at the time. It’s a reference, rather than a part of the installation itself, and well worth (re)listening to, perhaps before visiting the gallery. As such it evokes the condition of young black men forced to go to war while living in a world of excruciating racial prejudice, and thus forced into becoming cannon fodder for an imperialist aggression. (Also check out Defense Secretary Robert McNamara’s “Project 100,000,” a plan that allowed the drafting of mentally or medically unfit soldiers into the Vietnam War). The gallery installation is centered around three dioramas that suggest or frame implications about the culture of the Vietnam era. They are, like many modernist abstractions, inscrutable and need unpackaging. One of the dioramas, containing images of abstract DeStijl artist’s posters, appears as an active studio, a glass floor and modernist office chair, suggests a walk-in painting by Mondrian himself and implicates Dow Chemical in supporting modernism. Dow Chemical, a Midland Michigan based company, was the manufacturer of Agent Orange, among other defoliants listed with banal, cartoony names, in the exhibition, responsible for cancers and the birth of deformed children, that resulted from its use. Anchoring the exhibition on the back wall of the gallery is a remarkable group of fifteen paintings, by the artist-curators, of mission patches that were created by soldiers and worn on their uniforms. 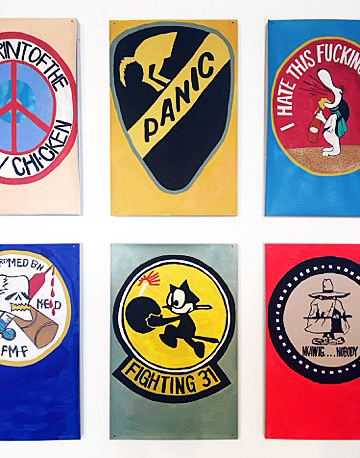 These were not official military patches but were designed as unofficial commentary by soldiers, and judging by the content of cartoons such as “Snoopy” and “Felix the Cat,” many of them were quite young. Perhaps most disturbing patch is the “peace sign” inscribed with the words “Footprint of the American Chicken,” ironically of course, since the Peace Movement was an effort to save these same young men’s lives. 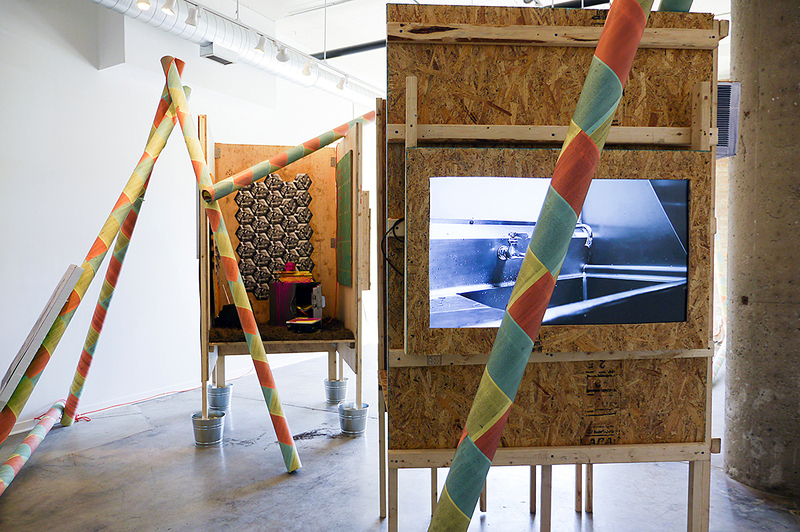 A prominent design feature of the exhibit is a group of long, tubular columns, crisscrossing the gallery and papered in Harlequin-patterned copies of the Pentagon Papers. Uncertainly the Harlequin pattern, a common evocation of Commedia del’ Arte theater, may signify the circus atmosphere of the Vietnam era and the hysterical, comic atmosphere of the Pentagon Papers themselves, and especially the interchangeability of comic figures participating in both Vietnam history and contemporary White House charades. 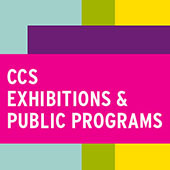 Nevertheless, the Pentagon Papers and the subsequent melodrama of the Watergate break-in, including all of the players in the Watergate cover-up, are featured in the exhibition’s graphics. John Ehrlichman, G. Gordon Liddy, E. Howard Hunt, John N. Mitchell, especially Robert McNamara and Henry Kissinger: these are names all too familiar to anyone who grew up during the Vietnam era, and prefigure current White House players. There is little narrative description of the roles of these actors or of any of the events that took place, but rather the exhibition serves as a prompt for remembering and revisiting the moment while providing a continuing context for thinking about contemporary events. “Garden of Delights” is then a kind of modernist historical sculpture. A text by renowned artist/critic Donald Judd is supplied with the exhibition to warn of the dangers of nationalism and its effect on artistic practice and is a reminder that nationalism, the trademark of our new Presidents regime, affects not only political thinking but our overall ideology. 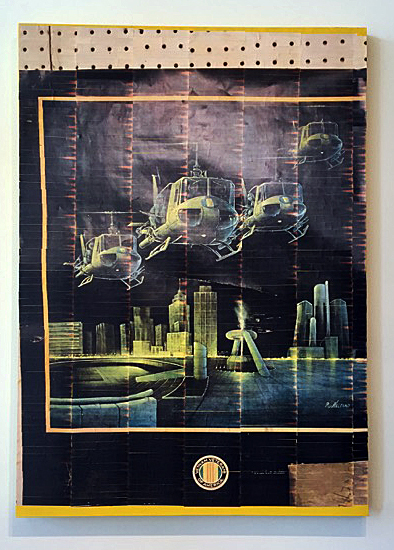 One particularly poignant poster in the exhibition, a copy of which hangs in the Old Miami Bar in Midtown Detroit where Vietnam veterans congregate, is a rendering of iconic Huey helicopters hovering over Hart Plaza on Detroit’s riverfront. It’s a chilling sort of cartooned fabrication that reminds us of our Detroit soldiers who lived and died in that hell. In a separate video on one of the dioramas the famed helicopter is also featured as a toy being pushed into a stainless-steel sink, simulating the dumping of Hueys off aircraft carriers in the evacuation of Saigon in 1975. We rarely see politics and war as the focus of contemporary art and with a semiological strategy of signing not explaining, “Delights of the Garden” is remarkable installation. It’s a painful reminder for those who grew up amidst the assassinations of the Kennedys and Martin Luther King, the inevitable and necessary birth and growth of Black Nationalism, of the racial revolutions in Detroit and Newark and the rest of the country, of the Watergate cover-up, with resounding echoes in the current White House as well as the rest of America. Join artists Ben Hall, Andrew Mehall, and Jason Murphy for an informal closing reception for “Delights of the Garden” on Saturday, April 8, 5-6 pm.